Hi. I'm off to work today and tomorrow. I have made this card for a co-worker/friend whose best friend is expecting a baby. It's of course a House Mouse Design. Papers are from Nana's Kids paper stack. Border punch is by MS. The sentiment continues inside with to make a family happy and make a home complete. My sister and I went to Hobby Lobby today. Got lots of stuff. Copics are on sale for 30% off!! I'm entering this card in the Simon Says Stamp Challenge. There is a link to this challenge on the right. The challenge was to make a baby card. What a sweet card!!! 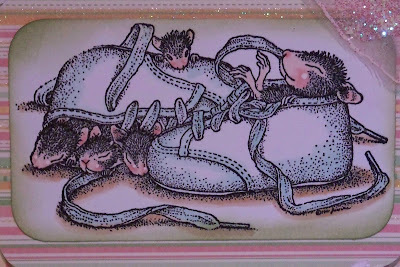 I really must get some House Mouse images printed off - they ALWAYS make me smile!!! Your friend will be ecstatic to get such a lovely card! Naaaw this is absolutely gorgeous! 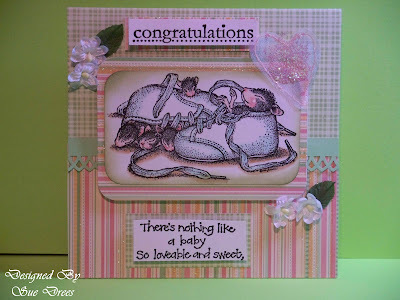 Your colouring as always Sue is gorgeous and I just can't stop looking at the cute little mice! WOW what a bargain with the copics! Just got back from Nashville and trying to get up to date with your blog -- this is such a sweet card and I know it will be adored by the recipients. Copics? on sale? -- where's my purse? This motif is so sweet.. for me it´s very difficult to color HM motifs .. I´m more successful in coloring the PB motifs...don´t know why?! Hope you find good new stuff on the Sale! Wow, this is gorgeous. 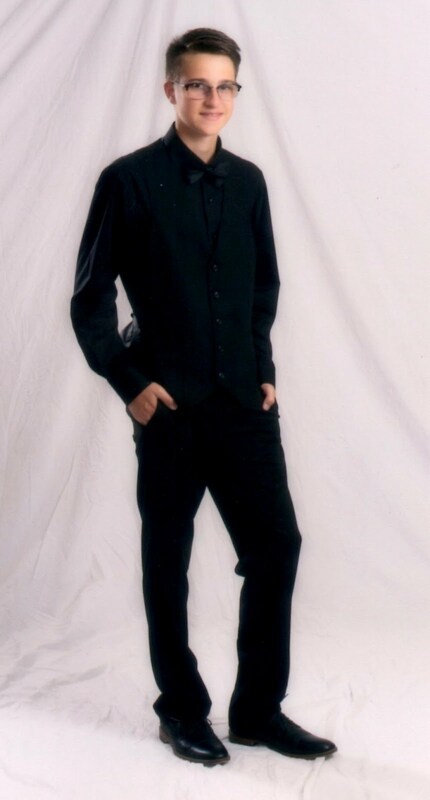 I have this image too, its lovely. Those papers are wonderful - love em!! Sue this image is the sweetest - You must have one BIG HM collection! I've yet to start mine - but my list gets longer every time I visit here! LOVE this card - gorgeous!